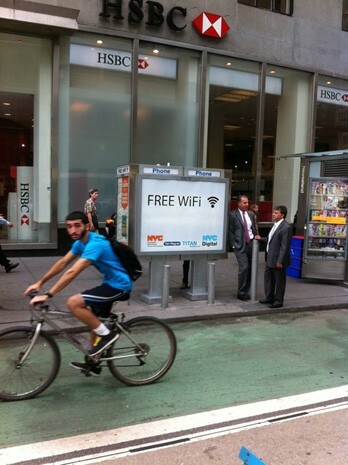 New York City has pulled off something amazing: the city has equipped last Wednesday free WiFi service to its payphones. This pilot program provides all residents of the five boroughs and the tourists they love to hate with free wireless Internet access. So far, the free WiFi hotspots have been available to just ten locations across Brooklyn, Queens, and Manhattan. The service will also roll out to the Bronx and Staten Island. You can tell the city payphone provides free WiFi with its very conspicuous signage, as you can see in the photo. You can check out the source links for specific locations of these WiFi-strapped payphones.